Yeah I recognize that girl. I took her from rags right through to stitches. Oh baby, tonight we sleep in separate ditches. Deep in the woods, Deep in the woods, Deep in the woods a funeral is swinging. We drove to a place deep in the woods. We crept in the shadows but no one was around. 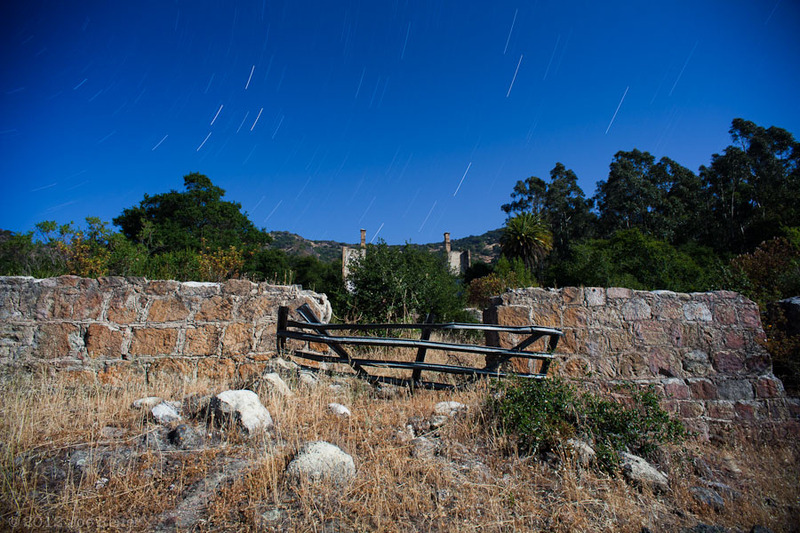 The extensive stone ruins of a 19th century resort are fenced off, forgotten, and being eaten by trees. Who needs caffeine to stay awake when coyotes are howling all around you? The full moon blazes bright in the open, but the woods are thick and dark. What's that rustling in the undergrowth? 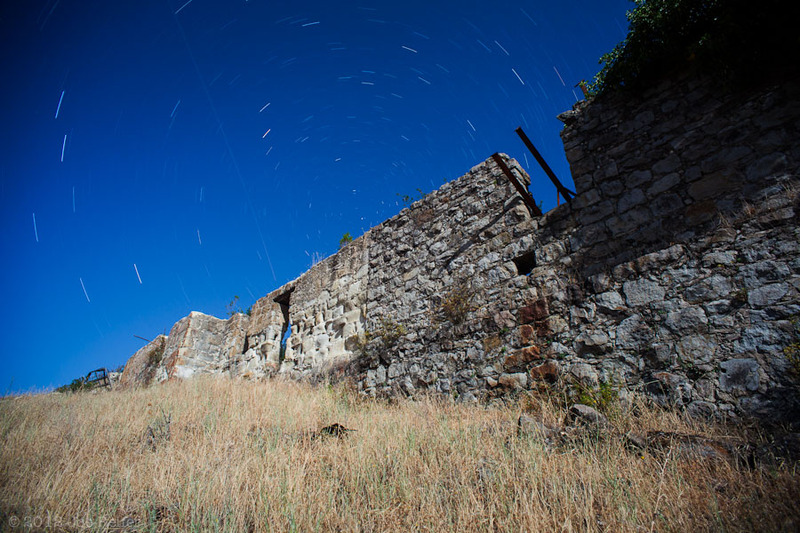 We photograph the buildings and foundations until the moon has arced low in the west. We disappear as night slowly fades back into day. These woods haunt me. I hope that comes through in the photographs. A 20-minute exposure during moonrise from the rooftop of the tallest building in the courtyard of the Impossible City. This small fake town at Fort Ord was built for military training. All areas are visible from nearby buildings, which makes getting from point A to point B almost impossible. The Dumbarton swing bridge is an abandoned railroad bridge that runs across the San Francisco Bay just south of the Dumbarton Bridge (Highway 84). Built in 1910 and abandoned in 1982, the bridge carried freight over the south end of the bay. A bridge operator would sit in the house on top and swing the bridge open if a tall boat needed to pass through. This 10 minute exposure with the moon 64% full shows star trails and planes taking off and landing at SFO airport. The hike down the abandoned railroad tracks is just under 2 miles. The bridge is bordered by a water treatment plant and wildlife refuge. We saw people working at the plant during our hike, a lot of birds, and almost got sprayed by a skunk. This view from the marsh area next to the bridge is a 15 minute exposure. The airplane flight path was pretty consistent over this time, and the plane trail reflections are also visible in the water. 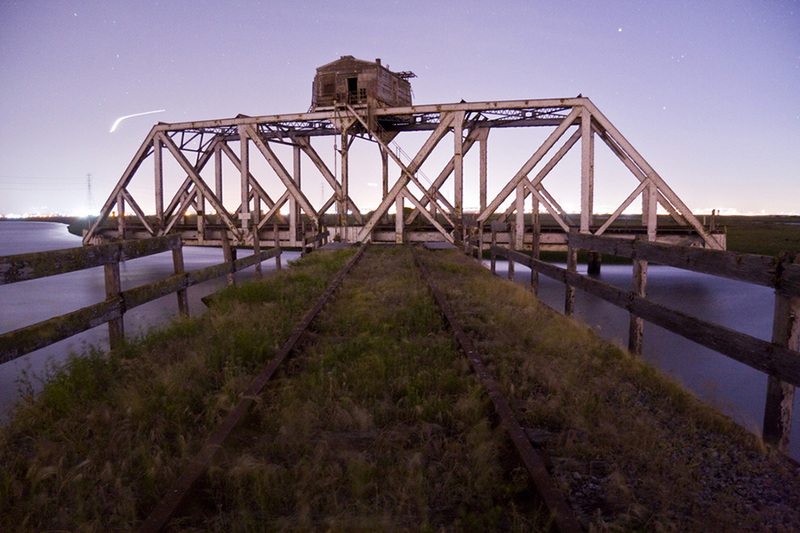 Photographer Sean Goebel visited the bridge back in 2009 and made this photo of the overgrown end of the line. Thanks to Sean for inviting me on this return visit to photograph the bridge. More of his photos can be seen here. A Peanuts cartoon mural in the children's ward of an abandoned military hospital. Unlike the smaller murals in individual rooms, this larger play area piece shows the whole gang including Snoopy, Sally, Linus, Charlie Brown, Peppermint Patty, and Woodstock. Those familiar with exploring abandoned buildings will notice the telltale signs of scrappers tearing out the ceiling tiles to search for metal to salvage. Technical note: The dynamic range was much too wide to capture this scene in one shot. The image above is comprised of 3 long exposures on a tripod, blended together manually on layer masks in Photoshop. If I hadn't told you this information, would you have noticed? Hopefully you were too busy looking at the content and wondering how this space looked in the past. 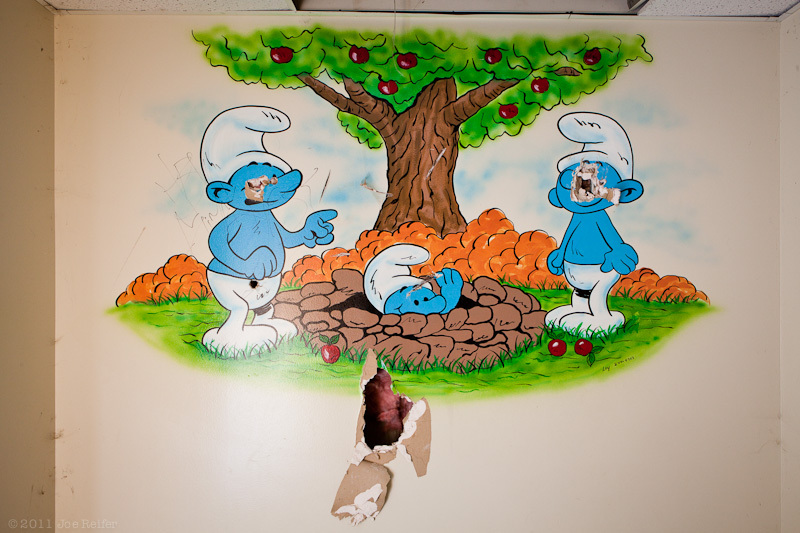 The basement level children's ward in the abandoned hospital at the former George Air Force Base has a series of cartoon murals on the walls. George AFB is located in the city of Victorville in the Mojave Desert, and was decommissioned in 1992. Renamed the Southern California Logistics Airport, the site has been used to film a number Hollywood movies, and also has an impressive boneyard. Some of the old base housing has been used by the Army and Marines for urban warfare training. The hospital building interior and some of the surrounding buildings show considerable evidence of paintball use. 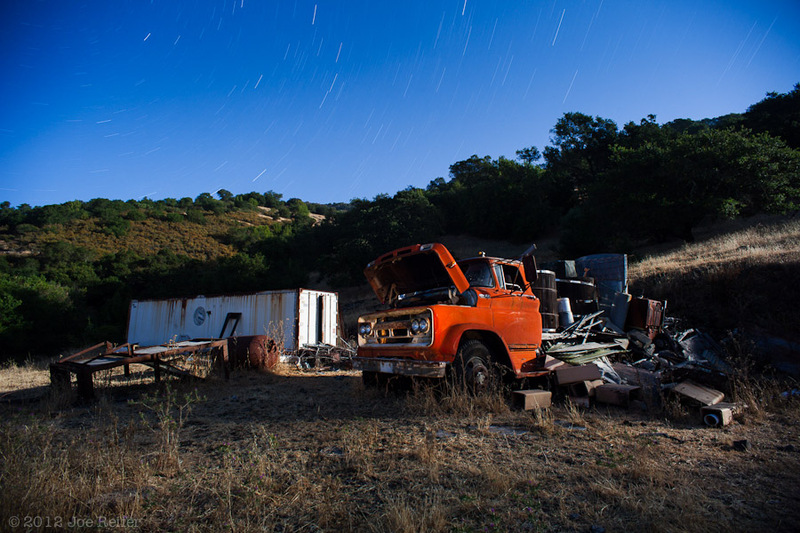 This panorama of a burned area at the former George Air Force Base was taken just after sunset. My fingers were so cold that I could barely press the shutter button. Nine hand-held vertical images were stitched together in Photoshop CS5 using the cylindrical setting in Photomerge. The tripod mounted panoramas that I took on this trip went together quite easily, but this hand-held image presented a more difficult stitching challenge for Photoshop. The yellow line in the road required multiple adjustments on layer masks and some minor use of Free Transform to line up properly. 15-20 minutes worth of work and it's good enough for web presentation, but would the file would require more exacting work to be print ready. Had I taken this image on a tripod with a leveling base and nodal slide, the post-processing would likely have been much more straightforward. Lesson learned.